Unbroken is a true American story about a boy born of Italian immigrant parents, one Louie Zamperini. As a child, Louie is bullied and inclined toward fighting and mischief, which includes smoking cigarettes surreptitiously and drinking liquor out of milk bottles. Feeling worthless, Louie turns to running at the urging of his older brother, Pete. He finds he is very good at running, becomes the fastest runner in history for a high school student, and ends up in the 1934 Olympic games, held in Nazi Berlin. Fast forward a few years to World War II when Louie is a bombardier on a fighter plane. When the plane he is on goes down somewhere in the South Pacific, he and only two other members of his crew (Phil and Mac) survive. Adrift on a life raft, they believe someone will rescue them, but they find it difficult to maintain the hope that will keep them alive. After many days at sea with slim hope of rescue, one of the three, Mac, dies. Louie and Phil hang on, but just barely. Just when you think things couldn’t get any worse for them, they are captured by the Japanese and put in a prisoner-of-war camp, where they are routinely beaten, tortured and brutalized. The snarling young Japanese commandant of the camp, known by the prisoners as “Bird,” knows that Louie was an Olympic athlete and singles him out for special mistreatment, at one point forcing all the other prisoners to punch Louie in the face, which they are, of course, reluctant to do. The only thing that keeps Louie Zamperini and the others alive in the face of unspeakable brutality at the hands of the Japanese is the determination not to give up. At one point, Louie says that making it through alive to the end of the war is the best way to get revenge. The will to persevere that he learned as an athlete in his younger days serves him well. We’ve seen life in Japanese prisoner-of-war camps in plenty of other movies—The Bridge on the River Kwai, King Rat, Empire of the Sun, Paradise Road, The Railway Man, to name a few—so that aspect of Unbroken seems familiar. Also we have seen plenty of harrowing stories about survival in World War II. 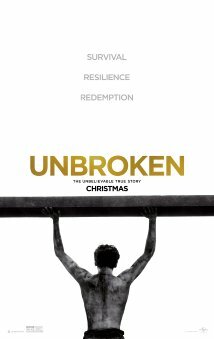 What makes Unbroken unique is that it was directed by a woman (Angelina Jolie) and that Louie Zamperini was a real—not a fictional—person that almost anybody could identify with. He died in 2014 at the age of 97. If you won’t give up, neither will I. Posted in Uncategorized and tagged Allen Kopp, capsule movie review, Unbroken. Bookmark the permalink.